date of online applications this HPPSC Horticulture Development Officer HDO Posts recruitment is 02-10-2018. Last date to online application for this HP Horticulture Dept Horticulture Development Officer HDO jobs is 21-10-2018. Apply online through HPPSC website of www.hppsc.hp.gov.in. Candidates will be selected based on written exam or personality test for these HPPSC Horticulture Development Officer vacancy. 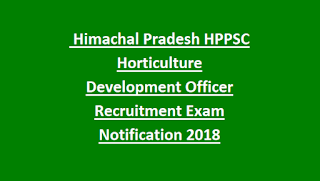 More information about these HPPSC Horticulture Development Officer posts of Horticulture Dept of Himachal Pradesh category wise vacancies, qualification, selection process, exam fee and other details are given below. 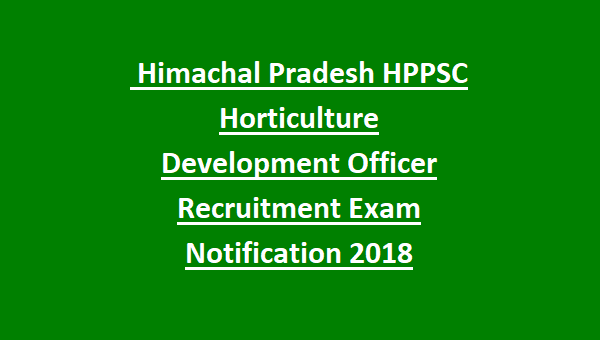 There are 71 Horticulture Development Officer jobs in this HPPSC recruitment 2018. Candidates age limits are 18-45 years as on 21-10-2018. M.Sc Horticulture or M.Sc Agriculture qualification is required. Must have studied degree with Agriculture or Horticulture is one of the subject. For General candidates HDO exam fee is Rs.400/- and for HP state SC/S.T/O.B.C. candidates exam fee is Rs.100/-. Based on received applications written exam or personality test or interview will be conducted for this HPPSC HDO jobs. Written exam pattern and syllabus details will be updated soon. or visit HPPSC website. Candidates who are qualified M.Sc Horticulture/ Agriculture they are eligible to submit the application form online through www.hppsc.hp.gov.in on or before 21-10-2018. Horticulture Development Officer jobs exam date, exam key release date, exam admit card release date will be updated in this website only. They said clearly only M.Sc Agriculture or Horticulture candidates are eligible to apply.